Does the table have any Lua script? Does this happen with just CE, meaning no table loaded? [QUOTE="TheyCallMeTim13, post: 53642, member: 91"]Does the table have any Lua script? hmm, just to test. Load the table and attach to the CE tutorial, just to see if it happens to any process with that table. It sound like it might be the table but if no scripts are ran, not sure why it's closing/crashing. Might be some odd anti-cheat/anti-debug, but with it not closing with just CE I'm not really sure. At this point I think this might be a question for BD/Eric. [QUOTE="TheyCallMeTim13, post: 53684, member: 91"]Might be some odd anti-cheat/anti-debug, but with it not closing with just CE I'm not really sure. Can you attach the table here? What do you mean crashes? It closes abruptly. or it freezes then closes after some time? 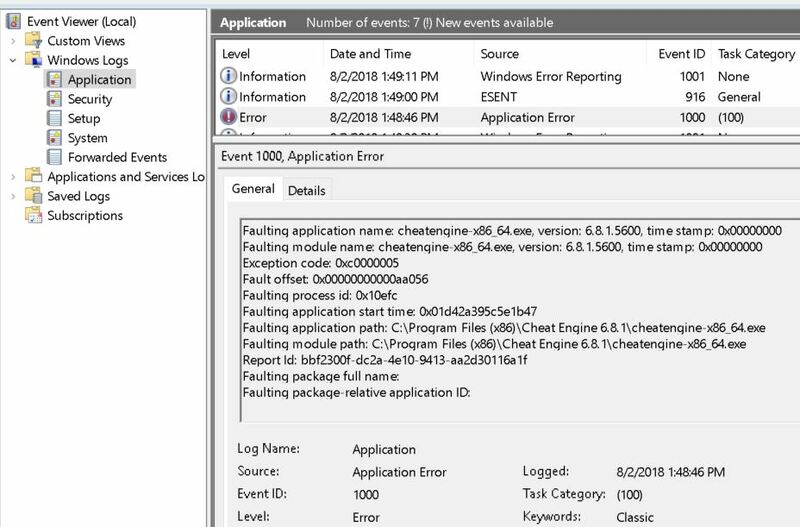 Can you check in Windows Event Viewer the Application and System logs? Windows logs if application becomes unresponsive or crashes. Yes i tried it with admin access doesn't work. What happens is that when I attach load the table it takes aboat 5 sec and then the windows popup comes up "Cheat Engine no longer works". I also looked at Windows Event Viewer but I don't really know what you want to know aboat it? 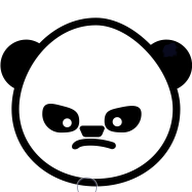 [USER=91]@TheyCallMeTim13[/USER] I tried with Starbound.v1.3.3. To get crash all I had to do was attach 64bit CE to the game and switch to event viewer and keep refreshing logs. Within few seconds it becomes unresponsive(not grayed out) and then closes. Then I tried with following combinations. I tried renaming and modifying caption of CE 64-bit. But it sill crashes. Following is event log of the crash. [USER=7561]@Bloodybone[/USER] If you have different findings then do share. I think error is with CE-64 bit exe. Last edited by koderkrazy on Fri Aug 17, 2018 5:27 am, edited 1 time in total. So Exception code 0xc0000005 seems to be an access violation. [*]An installed program such as the antivirus program that prevents the smooth start of a program.• Either corrupt or missing hardware drivers. [*]Corrupt or damaged system registry files. [*]Data execution security feature (DEP). But with this only happening with a loaded table (that has no Lua script), and only with CE 6.8.1; Still not sure. Do you have an AV program running? [QUOTE="TheyCallMeTim13, post: 53783, member: 91"]But with this only happening with a loaded table (that has no Lua script), and only with CE 6.8.1; Still not sure. Loaded table has nothing to do with it. I took AOB [ICODE]F3 0F 10 47 54 F3 0F 5E[/ICODE] from the table and opened fresh CE 64 bit, then attached to the game and did manual aob scan. It still crashed. It is not crashing with CE -64 bit v6.7. Also tried with antivirus disabled... still crashing. ? hmm, OP said just CE 6.8 (no table) didn't crash, but what you found makes a bit more sense. Seems like at this point I'd just stick with CE 6.7 for this game. And try to get this info to [USER=59]@Eric[/USER] / DB.